I noticed that while the wast majority of US Naval swords model 1852 have white grips (whether wood, stingray skin or plastic) there are a few that are black. Does it signify anything? I mean, did the regulations strictly specify the color of the grip or not? All m1852 officer swords were white grips. Do you have an example of what you see as an 1852 with a black grip? There are a number of other swords that are quite similar that did use dark grips. Which similar swords that use black grips did you mean? Thanks, I'll have to crack a book I have Peter Tuite's book on the swords, so he must mention any regulation. I imagine it is with change after the American Civil War. As far as the Cold Steel offering, I wouldn't use them as asource for history. Let me pull the book. For all officers-shall be a cut and thrust blade, not less than twenty-six nor more than twenty-nine inches long, half basket hilt, grip white. Scabbards of black leather, mounting of yellow gilt, and as per pattern. Repeated again in a following chapter on the pattern swords. Going further in the book briefly doesn't really mention darker grips but some sharkskin is darker than white ray and some other coverings (silver on some). A leather grip would likely have been a replacement or non-regulation import. Some sharkskin quite dark, more black than gray. Some presentation swords show such variations and certainly the German made swords with darker sharkskin. Still, the regulation kind of speaks for itself. The ACW still a period when regulations were more of an expectation than an absolute. 1. Have there been any significant changes in the regulations of the M 1852 US Navy sword in the last 160+ years? If so, what they were and when did they take place? In other words, do the US Navy sword made today (the reason I included Cold Steel link) and the one made 100-150 years ago follow exactly the same pattern or not? 2. When did the sword regulations became an absolute rather than an expectation? I mean, when it became unacceptable for a Navy officer to show up with a black grip sword? There had been no real changes in the regulations and changes other than blade width and the wear of them. The blades got narrower after 1872 and narrower again by the 1820s-1830s. The requirement to wear them during duty was dispensed with during the early 20th century and worn only for dress and parade. From a bit wider than an inch, to a bit less than an inch wide, to finally a very straight sword barely wider than 1/2". The "black" grip on the Cold Steel sword is simply wrong and typical of Cold Steel's lack of attention. Edit to say, I know they have white grip offerings and I imagine left hand offerings (which are completely ahistorical). It is probably the same plastic they use on several of them swords (rapier, dagger, backsword, etc). If you are thinking in terms of using the Cold Steel item as a dress sword in uniform, I imagine it will be in poor taste if not forbidden. The Cold Steel swords are not official regulation swords (despite any claims). I believe I already mentioned that Cold Steel is not to be viewed as any source for historical information. Thank you again for clarification. I do understand all the issues associated with the Cold Steel and their products. But after seeing a few late 19th - early 20th Century swords with black grips (links provided earlier) I thought they (Cold Steel) were following some pattern/regulation I was not aware of. Or that black grip was reserved for some branch/service within USN. Or something else. Do you know, when did the sword regulations became an absolute rather than an expectation? I mean, when did it become unacceptable for a Navy officer to show up with a black grip sword? Late 19th Century? Early 20th? The reason I ask is that I currently research one interesting M 1852 Navy sword, whose owner painted the grip white on top of original black skin/leather. I am trying to figure out what could have made him do it. What you are seeing as black are really dark gray and as mentioned, a factor of the hide and dirt. Exceptions of the stark white after the mid 1900s would have been true anomalies or perhaps a presentation.. I'm not trying to suggest one way or another on a third party sword without seeing it. If the grip is original to the sword, leave it alone. If the grip is black leather, show a picture of it, otherwise you are seeing an older sword with either fish skin or shark, which might look black but is not really. FWIW, I had painted a white Italian grip black because I wanted to, not to appease any regulation. Do you think this handle was repainted? It belongs to a sword made (most likely) in 1905 or shortly after. What you are seeing as black are really dark gray and as mentioned, a factor of the hide and dirt. Exceptions of the stark white after the mid 1900s would have been true anomalies or perhaps a presentation. Do you mean that by, say, WWI black grips were still acceptable? By "black" I mean something like the grip on the picture 2.88 from page 66 Tuite's book. If the grip is original to the sword, leave it alone. I am not going to do anything with it. To my eye the handle of the sword appears to be repainted (white paint on top of black skin/leather). I am simply trying to figure out why (and, more importantly, when) this has been done. Peter Tuite's description of the sword mentioned lists it as gray and is of the period I described. I know of no exact date, nor further regulation stipulating absolutes. As you have the book and likely Rankin's as well, I have nothing to really offer past their books. You might chat up the gentlemen at Sword Forum International and the US Militaria boards. Peter Tuite may be reachable as well. I met him very briefly at a Hartford Show some years ago. I have lost track of the website he had up for sale of items. An analysis of the paint might date rougly when it was altered but not necessarily when, or why. In your opinion does the grip of my sword (pictures attached earlier) look repainted or not? As Tim mentions painted grips (post 15 of the linked thread) and mentions the timeline of WWI, we are pretty much in the ballpark of timeline I mentioned but Tim may have further information. I meant, does it look it was RE-painted? And, if so, was this done during manufacturing or later? To me it seems as if originally there has been some sort of "black-ish" material (i.e., dark shark skin) on the grip. And, at some point, the owner re-painted it in white. In other words, does it look to you that the re-painting took place at the factory when the sword was made (Graham suggests it was done on cheaper Ames versions) or it has been done later by the owner? Not having the sword in hand, I am not eager to guess. What (if any) makers or retailers marks are there.? Can you display the blade etch? I'd rather not guess at all, when you have offered little data on the sword itself and all I have been able to offer is suggestion. Tim, and others, are far more familiar with these, so that suggestion to post to that thread may be of use to you. Can you display the blade etch?. At the moment I do not have the sword in hand either (working on its purchase). So I can only comment on the maker's mark. 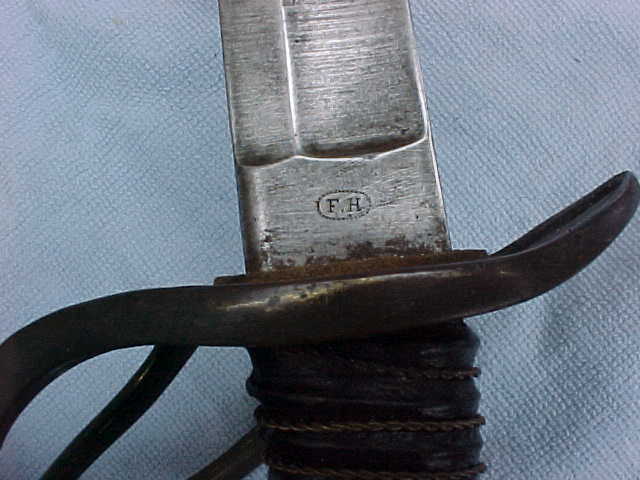 The blade has letters "F.H." in a circle of dots. I assume it stands for american branch of the "F. Horsters" company. The hallmark is very similar to the ones I attached but appears (by design) to be a bit more modern than those. Will do so. Thank you for the advice. To my eye it appears (regardless of the sword's type and age) as if some dark material shows up from underneath white paint. It's especially visible where the paint got rubbed off. Also the underneath material seems to have a certain texture/pattern (like some sort of dotted leather). I see it in a few places where the white paint became thin. Do you see the same thing or it's just my imagination? As you have the book and likely Rankin's as well, I have nothing to really offer past their books. A very good flash card deck type of book is the Medicus Collection book. As to the painted grip, my Horster sword is spelled out EF Horster, I don't know about the mark you mention. Yes I see the skin under the paint but there is no way for me to speculate when or why.